The issue took a tragic turn in August 2000. Two people died - one of them a Senior Immigration Officer - and 48 were injured when right of abode claimants set fire to an office in the Immigration Tower. Of those injured, 25 were Immigration Department staff. In the most recent test case in January 2002, involving some 5 000 claimants who were mostly ruled ineligible to claim the right of abode, the government was criticised in the media for lacking compassion or being callous. However, it should be emphasised that the majority of claimants are not children but adults, ranging in age from 19 to 70. According to a sample survey conducted by the Immigration Department many, if not most, of the claimants themselves have spouses and children in the Mainland. Throughout the appeal period the claimants were treated fairly and compassionately. All claimants were eligible to apply for legal aid. All were able to seek redress through the courts. All had access to heavily subsidised medical care through Hong Kong's public hospital system. Of the 3 800 claimants now (mid-June 2002) remaining in Hong Kong after the January 2002 judgment, only about 300, or 7%, are aged under 18. In January this year, Mainland authorities announced that children under 18, with parents living in Hong Kong, should be able to enter Hong Kong within a year. It should also be noted that Hong Kong's immigration policy, like that of many other jurisdictions, is based on controlled and orderly entry. Every year, 54 000 Mainland migrants come to settle with their families in Hong Kong - the equivalent to 0.8% of our population. Few other jurisdictions can claim such an intake and assimilation rate for migrants seeking family reunion. The government stated clearly that there would not be an amnesty for those who lost the most recent court case and who were clearly not entitled to settle in Hong Kong permanently. It would be unfair to allow claimants to 'jump the queue' ahead of others who have been waiting patiently and lawfully in the Mainland to come to join their families. This stance was supported by a vast majority of Hong Kong people. In April 2002 the government started to deport claimants who had not returned voluntarily to the Mainland. The January 10, 2002, CFA ruling provided a firm legal basis for that action. Hong Kong has established itself as a regional centre for arbitration. The number of cases heard by the Hong Kong International Arbitration Centre (HKIAC) has risen substantially over the past decade because of the increased popularity of arbitration and mediation to resolve disputes, and the growth of the HKSAR as a regional dispute resolution centre. Arbitration awards made in Hong Kong can be enforced in more than 120 jurisdictions that are signatories to the New York Convention on the Recognition and Enforcement of Foreign Arbitral Awards. Disputes referred to the HKIAC rose from 94 in 1991, to 218 in 1997 and 307 in 2001. The HKIAC handles significantly more cases than similar arbitration centres in Japan, Singapore, Malaysia and Korea combined. Hong Kong remains one of the world's safest large cities. This is mainly due to a high visible police presence on around-the-clock foot patrols; strictly-enforced laws on the possession of guns and other lethal weapons; and, a law abiding community that respects the rule of law and the work of law enforcement officers. Hong Kong's Police Force - often referred to as 'Asia's Finest' - is well trained and equipped. The Police-to-population ratio of 417 officers for every 100 000 people is one of the highest in the world. It compares to about 339 in Tokyo and 205 in Singapore. 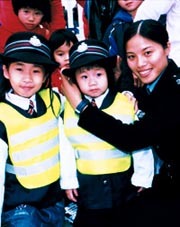 The Hong Kong Police Force has about 38500 members, including 27 930 regular officers, 4 620 Auxiliary Police and 5 860 civilian support staff. Amongst others, it has specialised units to deal with organised crime, airport security, crowd management, vulnerable witnesses and VIP protection. The Police Force has continued to maintain close liaison with international law enforcement agencies such as the FBI and the CIA, the Australian Federal Police, the Royal Canadian Mounted Police, Scotland Yard and Interpol. It has also developed close co-operation with law enforcement counterparts on the Mainland at policy and working levels. 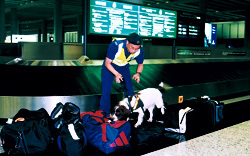 Such close relationships with Mainland and law enforcement authorities abroad have helped Hong Kong in the ongoing fight against organised crime, illegal narcotics, currency and credit card fraud and money laundering. Hong Kong has one of the world's busiest boundary crossings. In 2001, about 106 million people and 11.3 million vehicles crossed back and forth between Hong Kong and the Mainland. Every day, an average of about 313 000 people and more than 31 300 vehicles cross back and forth between the Hong Kong SAR and the Mainland, with most people heading into neighbouring Guangdong Province.